For over half a century, Rolex’s Day-Date reigned as their flagship line of timepieces. However, in 2012, Rolex unveiled a new, highly complicated wristwatch that was intended to occupy the top spot among their ultra-premium lines of wristwatches: the Sky-Dweller. Although somewhat visually similar to Rolex’s current Datejust and Day-Date watches, Rolex’s Sky-Dweller is a very different timepiece. Looking past the fluted bezel and classic Oyster bracelet, the degree of mechanical intricacy becomes apparent. While it remains simple and elegant in appearance, the Rolex Sky-Dweller is more technically complex than many mechanical chronographs. With an extensive feature set intended for jetsetters and frequent business travelers, the Sky-Dweller is Rolex’s dressier approach to a multi-time zone watch. Although the dial of the Sky-Dweller is relatively simple and uncluttered in design, the watch is capable of simultaneously displaying the date and month, as well as two different time zones. The traditional, center-mounted hands display the local (primary) time zone, while a rotating, off-center, 24-hour disc simultaneously displays the secondary time zone in the center of the dial. The Sky-Dweller Reference 326939 is a ground breaking watch. 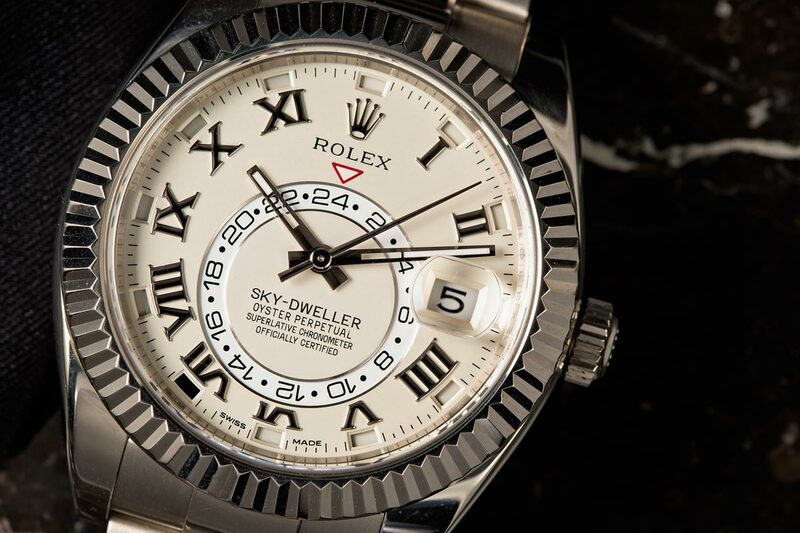 The Sky-Dweller also features Rolex’s first-ever, annual calendar. Known as Saros, this calendar mechanism is named after the Greek term for the cycle between the sun, earth, and moon. The complication automatically adjusts for the different number of days in each month, and only needs to be set once per year – at the end of February. The date is displayed at the usual 3 o’clock position, while the month is indicated by twelve, separate window-cutout indices located on the outmost rim of the dial surface. The Sky-Dweller’s extensive functionality is made possible by Rolex’s entirely in-house, forty-jewel, caliber 9001 movement. The caliber 9001 is the most complex Rolex movement currently in production, and seven of the fourteen patents that protect the Sky-Dweller pertain to the movement alone. Due to the degree of functionality of the caliber 9001 movement, Rolex connected the bezel of the Sky-Dweller to the movement inside the watch, in the same manner that they did with the caliber 4161 inside the Yacht-Master II line of watches. The linking of the bezel and the movement allows for an easier and quicker adjustment and setting process than would be possible through just the crown alone. Much like the Yacht-Master II, the Ring Command bezel of the Sky-Dweller is linked to its movement, and allows users to switch between different modes of adjustment for the two time zones and annual calendar. The Sky-Dweller Reference 326939 can keep track of the year. Keeping current with contemporary trends for larger watch diameters, Rolex’ new flagship Sky-Dweller is a large watch (by Rolex standards) with plenty of wrist presence. Although its overall shape and design are very similar to Rolex’s traditional Datejust and Day-Date watches, its 42 mm case diameter and secondary time zone displayed on a rotating 24-hour disc help categorize it as an unmistakably modern watch. Although it was initially only available in solid 18-karat gold, Rolex now offers their flagship Sky-Dweller line in a wide variety of different metal combinations. For those that want to enjoy Rolex’s latest flagship offering in all of its intended luxury, but who would also like a slightly more understated style, the reference 326939 Sky-Dweller is a perfect option. Craft entirely from 18-karat white gold, the reference 326939 Sky-Dweller has all of the premium feel and finish that Rolex intended for their new flagship timepiece; however the silver-colored tone of the 18-karat white gold makes for a much more subdued appearance that could almost be mistaken for a regular stainless steel Datejust when viewed from a distance – almost. This is a true premium watch that only the best get. Since the entire Sky-Dweller line is now just only several years old, the reference 326939 can be found both brand-new and pre-owned. As with any Rolex watches craft from precious metals, brand-new prices at authorized dealers will reflect high premiums that quickly taper off in the pre-owned market, and purchasing a lightly used reference 326939 Sky-Dweller allows prospective buyers to save significantly over the listed retail prices. Due to the extensive functionality of Rolex’s in-house, caliber 9001 movement and the reference 326939 Sky-Dweller’s exclusive use of solid, 18-karat white gold, a convincing replica would be difficult for counterfeiters to manufacture at an efficient price point. The level of proficiency in mechanical engineering, and the necessary precision required to properly manufacture a movement with comparable function to the caliber 9001 is far outside the capacity of most counterfeit manufacturers, so always verify that all functions of a Sky-Dweller work as they should before making a purchase. The watch is in white gold, making it a premium watch to have. Additionally, if purchasing a reference 326939 Sky-Dweller, make sure that the watch and bracelet are actually made out of solid 18-karat white gold. 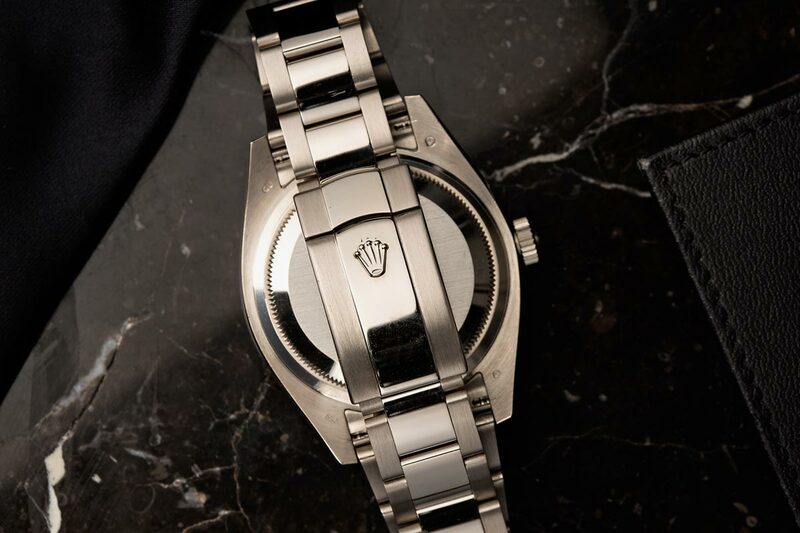 Many counterfeit manufacturers will try to pass off stainless steel or other plated metals as white gold, so if possible, always try to verify that a reference 326939 actually feels like the solid gold watch that Rolex designed it to be. For over fifty years, Rolex’s Day-Date was their premium flagship line of watches; however Rolex has designed the Sky-Dweller to take over the top spot within their catalogue. 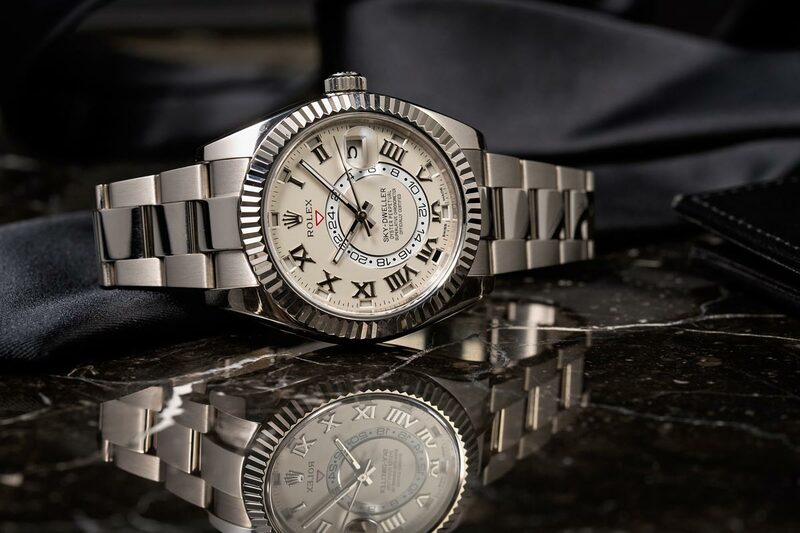 While the Day-Date is a mainstay of the luxury watch industry and still remains in production, the Sky-Dweller is Rolex’s latest premium offering that boasts unparalleled functionality among their various lines of watches. 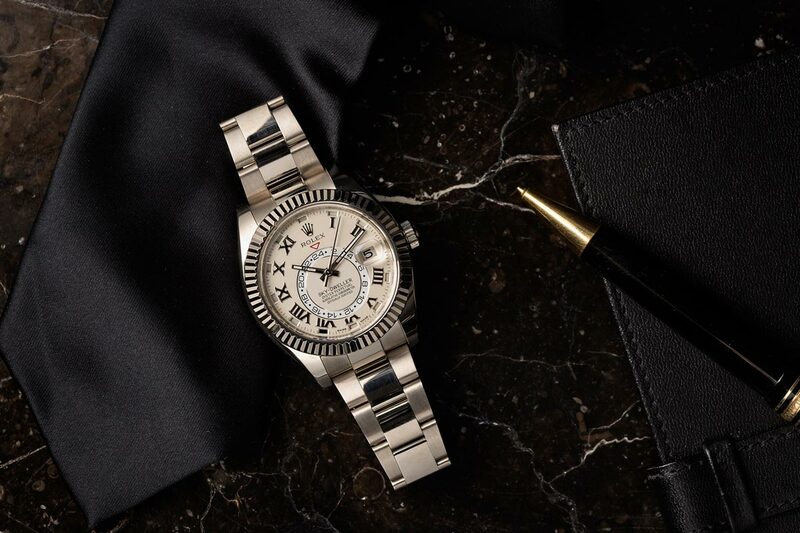 The reference 326939 white-gold Sky-Dweller is among Rolex’s most premium timepiece offerings, yet its classic, understated styling allows it to retain much of the legendary versatility for which Rolex watches are famous.